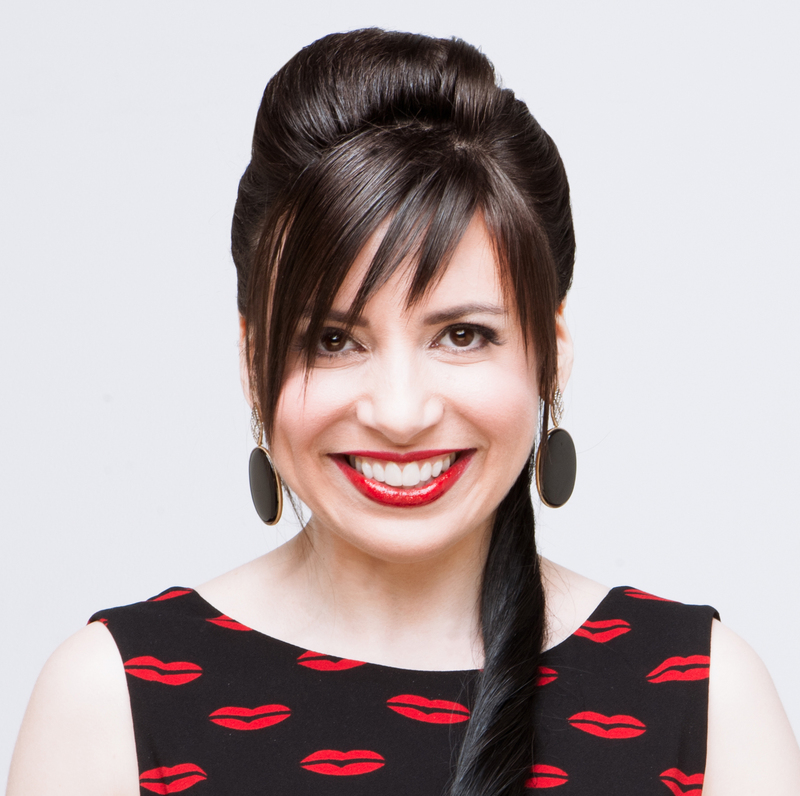 A belated thank you to the lovely Beth Bernstein (aka Beth Bejeweled) for including my Frog and Prince Maneater ring in InStore Magazine’s feature on spring jewelry! Ribbit! Click for the InStore “Garden Party” feature. The Frog and Prince ring was the first design in my Maneater series and I feel like I’ve neglected it a little. It’s true that it’s not set with an astonishing 429 diamonds like the Bull and Bullfighter Maneater ring, nor does it have a treasure chest that opens like the Dragon and Knight Maneater ring does. But it’s still ornate and one of a kind. 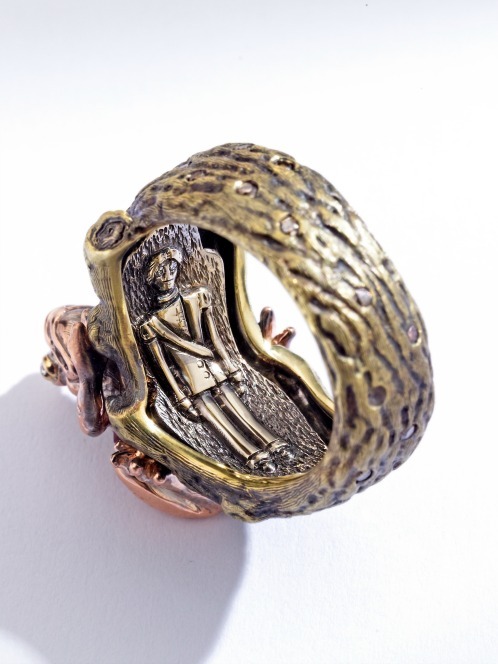 This ring started with four separate, hand-carved wax models that were later cast in four different colors of 18K gold. The branch-like shank of the ring is made of 18K yellow gold, which the prince hidden inside the ring is made of 18K white gold. The gold is oxidized, so that’s why it isn’t a bright white color. 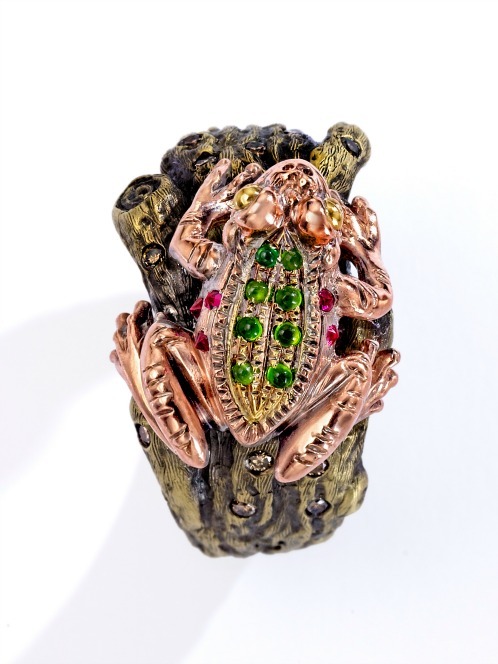 The body of the frog is 18K rose gold except for the back, which is 18K green gold. Click for the original post about this ring. Green gold isn’t a true green. 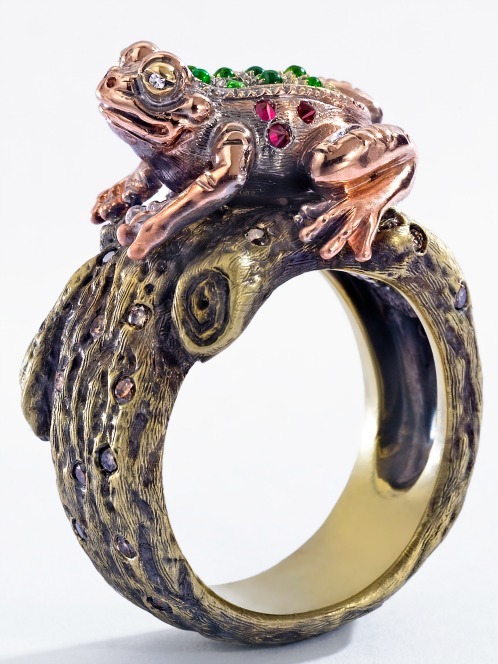 Instead, it’s yellow gold with a greenish tint, which — in this case — subtly emphasizes the color of the eight custom-cut tsavorite cabochons set on the frog’s back. 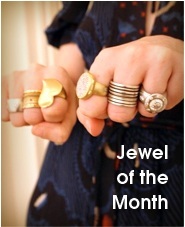 (The other gems in the ring are upside-down pink sapphires, as well as brown and white diamonds.) I’m not sure people would notice the difference between the green gold and rose gold if I didn’t tell them, but, to me, that’s part of what makes it art — attention to detail beyond what the naked eye can take in. Totally one-of-a-kind — whoever buys it will never see another like it on someone else. I’m still working on my eighth and final Maneater design — a necklace, instead of a ring. It’s likely to be finished next year. Part of me would like to see the entire eight-piece Maneater line go to a single collector who appreciates the cohesiveness of the concept. 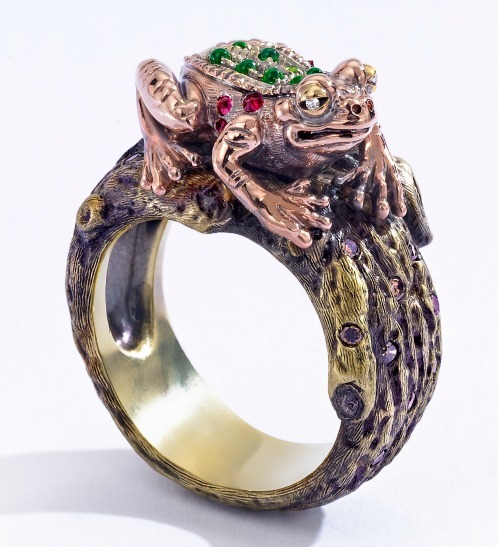 On the other hand (no pun intended), I could imagine the frog ring living happily ever after with someone who has an affinity for this particular design. 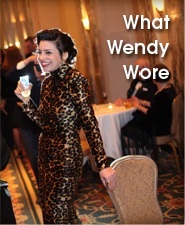 I will be content with any customer who appreciates the craftsmanship!